To apply the parking brake, pull the lever up fully. To release it, pull up slightly, push the button, and lower the lever. The parking brake indicator on the instrument panel should go out when the parking brake is fully released. 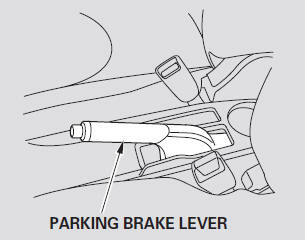 Driving the vehicle with the parking brake applied can damage the rear brakes and axles. A beeper will sound if the vehicle is driven with the parking brake on.